Eudon Choi first showed on schedule at fashion week for Fall 2012 last year. The South Korean designer trained first as a menswear designer in Seoul before moving to the Royal College of Art in London to study MA in womenswear. For Spring 2014 Eudon was inspired by the flora of Asia. He balances the masculine/feminine style with finesse. These season he focused more on the femininity of things. A white sleeveless asymmetric round neck dress took to the runway first paired with black and white ankle strap flatforms. Look 5 was one of my many favourites of this collection. A summery floral printed knee length coat in the gentle hues of pale pink and blue. Under hat was a navy sweater and a white skirt. Ankle strap wedges finished off the look. 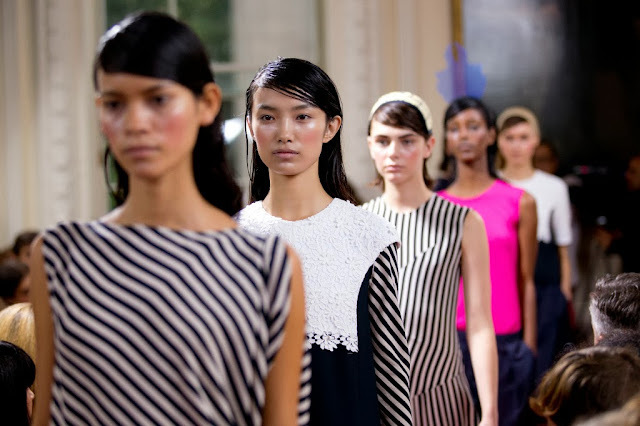 The models rocked rosy cheeks and other than that barely there make-up. For hair there was a wet look with the hair nicely sitting behind the ears so full attention was given to the looks being presented. Orientalism is a trend that has been revived since Spring 2013 most notably Prada. Each season it's returned and been interpreted in different ways. This year it's Kyudo. I can see this popping up at Paris Fashion Week among lesser known names and also established houses. Up and coming designers are all the rage right now (thankfully). All most all new designers are bringing something individual and unique to the frontline. Eudon Choi is a designer that does both of those things to perfection.